In Isaiah we can clearly see that it is not God who has lied, spoken falsely, or have blood upon His hands. In fact it is our sin, our lack in faith, our indiscretions which God has had to deal with over our short history here on earth. Think of each lie told as a small needle which God has had to defend against, each word uttered to condemn an innocent person to death as a razor blade cutting away at Gods justice, and look at each action that harms another human being done purposefully as a sword thrusted into the side of Jesus and then you will have just barely scratched the surface to the pain and suffering our Lord endured upon the cross. By sending Jesus, God again shows His unyielding love for all man kind, He finds the most awesome ways to prove His love over and over again. 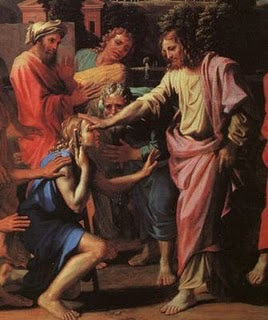 In healing a blind man who was blind from birth Jesus illustrates His love and mercy for us. This miracle is a two fold miracle, one that shows the power of God, but also shows the love of God. The lesson Jesus was teaching was that it mattered not to the blind man whether it be day or night, but as long as Jesus was in the world His light would penetrate every soul and make them see, even the blind who where blind from birth a medical condition which there is no cure. But moreover, this miracle shows that it matters not what we suffer, that God can take that suffering and us it to glorify Him, to bless us, and to show to others His unchanging love. The very notion of being the “Light of the World” is one that also proves Gods love, and the lengths He has gone to not just save us, but to also lift us up in His perfect love despite the many sins we have committed. The term Jesus uses is a technical one in heavenly speech, a term that Satan knows well as he was once the Morning Star in heaven. Jesus is the truth, the light, and all who follow will walk in ever lasting life. Satan, does not want this, so the scriptures tell us that Satan entered into Judas to betrayed Jesus. Think for a moment how glorified God was within this moment, think how magnificent God is to be able to shine through this great deception of darkness. Understand that God not just opened the eyes of a blind man, but of all men and women on this planet in that one moment of darkness, the light of the world indeed still shown through it. In these three examples God uses person strife to work the biggest miracles. He uses every occasion to test and mold each one of us into a more perfect person. He tests us to prove our loyalty and love to Him, which is the true miracle and the prove of His never changing love. God tested Abraham by having him offer up his only son to God as a burnt offering upon Mt. Moriah. Though Abraham did not want this test he proved his belief in God and trusted in his wisdom enough to follow through with God’s request, even up to the very moment of raising the knife high above his head, only then did God send His angeles to stop him. Again, God tested the people in the hot desert for forty years to hone them and to test each one of them. To bring them from a complacent slave like nature to one that was sharpened in every aspect of God, even unto their very last breath would they obey to build a nation in hostile lands. Finally God shows us the test of love through the greatest suffering of Job. Here was a man who had everything, and in Satan’s hands was brought down lower than low and still he refused to turn away from God. We are tested in our faith, in our actions, in our words, through our suffering. God chastens each one of us in order to bring us through each hardship, to prove his love on a personal level. God calls out to us and encourages the goodness to always shine through much like we see in Jesus upon accepting His divine mission here on earth.God Speaks about chastening his own son, and without this specialized attention we are like the lump of clay that has been cast aside. Jesus talked about praising God in the mists of your troubles, rejoice in your pain as God is always with you, and if you turn from this then indeed you have proven to God you are not one of his sons or daughters. Again this is not what God want’s for He prefers your heart to turn from wickedness and your spirit should have ever lasting life. God punishes but takes no pleasure in it. In Genesis Adam and Eve are kicked out of the Garden of Eden because of their collective sin against God. This was brought upon them by their actions. We see this repeated throughout the bible as this theme is again brought forth with Moses and Aaron who are told by God to gather the people and strike the rock to glorify God’s love for them by giving them water to drink. But Moses does not mention God before striking the rock, and in essence stole from God the glory due Him. In the last example found in Jeremiah God specifically states His wrath and punishment is due because of the sins and increase of the inequity of the people. Our suffering is forever linked to our sins, and the increase of our sins are linked to our increased suffering. Again God takes no pleasure form this but He does and will bring you closer to His perfect love through all your trials and tribulations you may suffer throughout your life. In these final three examples we see Jesus using sin, blindness, and death as a way to communicate His love, Gods power and might, all which glorifies God in the Highest. Jesus over and over gives new life in each action he takes, this proves beyond all reason of how much God truly loves us, to what lengths God goes to show His love, thus proving He has not changed, His mission has not changed, but rather God has always been the God of love, mercy, forgiveness, and a God of many chances. Reflection 9: For When Your Soul Is Depleted? As I write this reflection this week, I wanted to express that though life is not easy, and there are doors which shut for no reason there is a light at the end of the tunnel. Though there might be pitch black in every direction and the feelings of helplessness, and loneliness might be creeping in there is hope in Jesus. So I write this first to set the stage so to speak, so the raw emotions that most certainly was present upon that first Sunday after the death and resurrection of our Lord and Savior, there might be clarity amongst all the religious noise of this Easter season. “44 It was now about the sixth hour, and darkness came over the whole land until the ninth hour, 45 for the sun stopped shinning. And the curtain of the temple was torn in two. 46 Jesus called out with a loud voice, ‘Father into your hands I commit my spirit.’ When he had said this, he breathed his last” (Luke 23:44-46, Zondervan NIV 2002, p.1618). Jesus often reminds us that the struggles we endure here on Earth, as flawed mortals, has less to do with our petty squabbles with each other, but has more to do with the war which is raging between our heavenly soul and our sinful flesh. It is not a physical war that we can use our five senses to protect ourselves against our aggressors, but rather it is a spiritual one which drains our energies making us change our minds and to give into temptation. Our bodies cannot win this war, because we were not created to win it as flesh and blood creatures within sin. Rather through our spiritual weapons made known to us as having absolute faith in God will the victory be realized. The death of Jesus was caused by physical torture, his fight however was not focused on the physical pain he endured rather the war of the soul. Our Lord and Savior died on the cross not to illustrate his so called dishonor of the Jewish faith but rather the willingness to sacrifice his life as a spiritual payment that would build faith in his true mission. Thus through Jesus Christ, and by emulating his example of perfect faith in our Father in heaven, within that very moment that he committed his spirit to God, did he then claim victory over Satan, reclaiming the world for all mankind. “33We are going up to Jerusalem,” he said, “and the Son of man will be betrayed to the chief priest and teachers of the law. They will condemn him to death and will hand him over to the Gentiles; 34who will mock him and spit on him, flog him and kill him. Three days later he will rise” (Mark 10:33-34, Zondervan NIV 2002, p.1547). This was the second warning of Jesus to his disciples describing in detail what was going to happen, in an attempt to prepare them. It proves that he knew what was to befall him, but he went to Jerusalem anyway. Jesus had so many other avenues he could have taken which would have spared him this horror, but his fight was not of the flesh, but of the spirit. His perfect faith in God, gave his mortal body the strength to face the final showdown between God and Satan. “8 Again, the devil took him to a very high mountain and showed him all the kingdoms of the world and their splendor. 9 “All this I will give you,” he said, “if you will bow down and worship me.” 10 Jesus said to him, “Away from me, Satan! For it is written: ‘Worship the Lord your God, and serve him only” (Matthew 4:8-10, Zondervan NIV 2002, p.1473). Spiritually speaking, even though Jesus’s disciples had witnessed his many miracles, and professed with their lips their belief that he was the Messiah, their hearts where still empty and starving. Their souls were depleted and almost ready for the final miracle. Ironically none of them got it; none of them realized that Jesus was at war, he was fighting a battle to which none of them could see with their own eyes. None of them realized the severity of his actions and teachings until the very moment he appeared to them after Easter. I find myself thinking how hard it is to accept the fact Jesus knew of the absolute pain and indignity he was going to suffer and yet he still chose to carry on with it. So we can’t really fault his disciples who loved him as a brother and did not want to see him die. But we then must ask; if not Jesus then who would have faced Satan, faced the cross? The real question is who else could have? “3 He was despised and rejected by men; a man of sorrows, and familiar with suffering. Like one from whom men hide their faces, he was despised, and we esteemed him not. 4Surely he took up our infirmities and carried our sorrows, yet we considered him stricken by God, smitten by him, and afflicted. 5But he was pierced for our transgressions, he was crushed for our iniquities; the punishment that brought us peace was upon him and by his wounds we are healed” (Isaiah 53:3-5, Zondervan NIV 2002, p.1473). “Fortunate are the eyes that see what you are seeing. Many prophets and kings wished to see what you now see and never saw it, longed to hear what you now hear and never heard it” (Lost Gospel Q, Q33, p.67). We celebrate Easter because that is when our sin debt was paid in full. I write about this first Sunday after Easter so that we will remember how empty our souls where as the hunt for our risen Lord began. The miracle that is Jesus, that was his resurrection, his absolute faith in our father that was revealed and proven. Even unto the very moment of his death his soul was not depleted, but from time to time ours is, so this is but one reason why we need him. 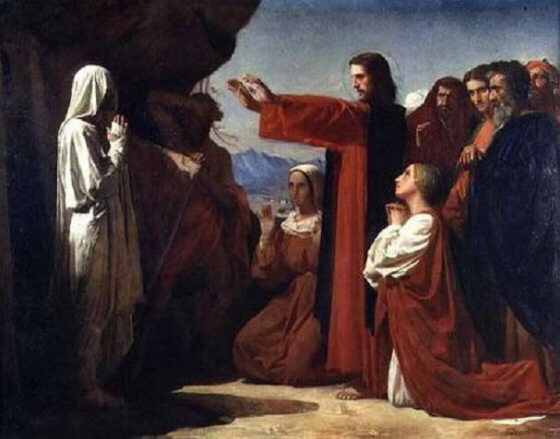 I write about this first Sunday after Easter to also illustrate how God planned this event, how Jesus obeyed our Father, how we came to believe. “A week later his disciples were in the house again and Thomas was with them. Though the doors were locked, Jesus came and stood among them and said, ‘Peace be with you!’ 27 Then he said to Thomas, ‘Put your finger here; see my hands. Reach out your hand and put it into my side. Stop doubting and believe.’ Thomas said to him, “My Lord and my God!’ Then Jesus told him, ‘Because you have seen me, you have believed; blessed are those who have not seen me and yet have believed” (John 21:26-29, Zondervan NIV 2002, p.1671). Posted on April 11, 2010 Author Brother BrianCategories Gods Truth SeriesTags Easter, Easter Season, God, Isaih, Jesus, John, Luke, Mark, Matthew, ThomasLeave a comment on Reflection 9: For When Your Soul Is Depleted?